The HD Mini is pocketable size, with a glossy glass front and a tactile rubber back. Windows Mobile 6.5 is an awkward operating system made fluid by HTC’s intuitive Sense interface. We are always happy to see a 3.5mm audio port, and the five-megapixel camera is capable despite not having a flash. The capacitive touch-screen is pleasing and responsive, and everything happens quickly with no delay. While no smartphone will give you much more than a day, the HTC HD Mini does have enough stamina to last a bit longer – although we would still recommend charging it up daily. HTC is riding high at the moment. A string of top-class Android phones – the Legend, the Desire and Google Nexus One – as well as the HD2, the best Windows Mobile phone yet, have firmly positioned the company as a smartphone giant. Its latest handset, the HTC HD Mini, is the successor to the HD2, the first handset that made the tricky WinMo OS effective and attractive, largely by covering is with a useable interface. The HD2 was also the first WinMo phone to have a capacitive touch-screen, which look and handle better than the pressure-sensitive resistive kind. But it was big, at 4.3 inches, and proved too much to lug around for some users. The Mini has a 3.2-inch capacitive screen, which brings the overall size of the phone down to a more manageable size and still gives you space to view content effectively. The build quality is superb, with a tactile rubber covering on the back complemented by stainless steel screws to give an elegant industrial look. The front is smooth and slick, with touch-sensitive icons that sit next to the display. These are start and end call, home and back keys, and a dedicated Windows Mobile key. This will take you to Microsoft’s list of shortcuts including Internet Explorer and Microsoft My Phone, which syncs up contacts calendars and more. There are also some HTC apps on the list such as Twitter client Peep. 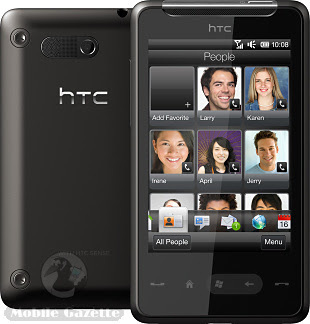 HTC’s talent with Windows Mobile lies in its Sense software, which cloaks the awkward WinMo with a friendly interface. The home screen displays the clock and weather app that will be familiar to existing HTC users, with its little weather-specific gimmick that shows windscreen wipers when it’s raining and so on. At the foot of the home screen is a carousel of shortcuts including mail, messages and even share prices – well, it is a business phone after all – that are easy to slide between. As an alternative you can swipe your finger up the screen to make the clock disappear and be replaced with a grid of nine shortcut blocks. You can configure these to contain all sorts of useful items, including internet sharing to easily connect to the web from your laptop using the phones 3G connection. Beware of the small-font menus though – a seeming speciality of Windows Mobile. The five-megapixel camera doesn’t include a flash, which is a shame. Camera flashes aren’t often that good but they at least give you some option to shoot in low-light conditions. Still, it’s a capable enough snapper. When the screen is locked, it displays missed calls, messages, emails and voicemails. Touching the relevant part of the screen won’t take you straight into your inbox or contact, it just takes you back to the home screen and lets you find your own way. But that’s not too much of an issue thanks to the neatness of the Sense UI. This is best demonstrated by the email inbox: Swipe you fingers up and down, and shortcut images of your emails slide on or off the pile. Press one of these to get into the message. The smart virtual keypad has haptic feedback and great error correction, and is comfortable enough to make typing messages and texts a breeze.